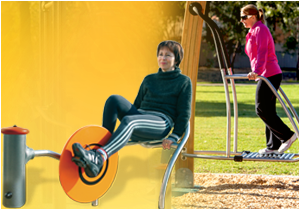 Vitality Areas provide social fitness opportunities that feature equipment for activities such as rowing machines, running machines, exercise bikes, wall bars, etc. Presented as one station, Vitality enables users to work on their endurance or their stamina while coming together to meet and socialise. The Vitality Areas are systematically equipped with specific signs to inform users of the level of difficulty of each exercise and the output required for the activity concerned.